San Diego is world famous for the quality of its craft beer, and also the creativity and innovation of its brewers. Of all the styles of beer the county produces, it is probably most famous for the creation and development of the “West Coast” or “San Diego Style” IPA, which is – above all other things – a super-fresh, super-hoppy, full-bodied beer that makes most other American IPAs seem like Pilsners or Kolschs. This “no excuses” style of IPA has become one of the hallmarks of San Diego brewing, but it has also presented one downside: The bigger beers tend to also be higher in alcohol and, thus, limiting in the amount that can be responsibly consumed. When you talk with brewers, you find out that most of the great innovations in craft brewing start with what the brewers most want to drink for themselves. Being consummate hop-freaks, brewers – like any craft beer fans – want to be able to enjoy a big, satisfying flavor without being knocked on the floor after a pint or two. Enter the latest (and greatest) trend coming out of our brewing community: The San Diego Session IPA. The goal with a session IPA (named for its ability to be consumed in a “session,” meaning more than one) is to provide all the bright hoppy aromas, flavors, and body of a West Coast IPA without the attendant higher ABV. Needless to say, for the most die-hard hop-heads out there, this brewing trend is nothing short of manna from heaven. How Do They Brew Session IPAs? Each brewer has his or her own unique technique, and each is striving for a specific flavor profile. In most cases, brewers rely on the dramatic effects of heavy dry-hopping or “hop bursting” to pump up the aromas and flavors of their session beers. And many brewers have employed newer varieties of hops – recently released onto the market – to provide higher alpha acids, aromas, and compounds that more efficiently produce the desired effect. Mosaic and Galaxy hops have become quite popular in this regard, as are other newer hops – such as Cashmere, Motueka, El Dorado, and Meridian. 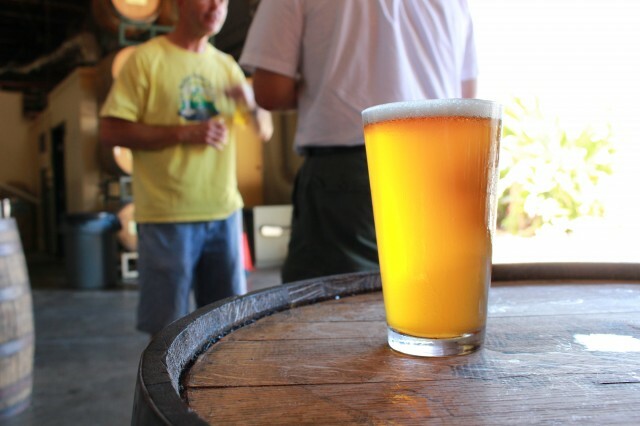 Lots of San Diego brewers have embraced the session IPA concept, so you’re likely to find some sort of session offering at a majority of tasting rooms around the county. For our purposes, I have defined a session IPA or pale ale as anything 5.5% ABV or below. Here is a small (and very incomplete) listing of session brews (in ascending order by ABV) that are especially notable for their great hop aromas, flavor, body, and ultimate drinkability. So go out and start a session today! Go To IPA (4.5% ABV) – Stone Brewing Co. Hop Solo Session IPA (4.6%) – Mother Earth Brew Co.
Penalty Shot/Evacuation Pale Ale (5.3%) – Nickel Brewing Co.
Publican IPA (5.5%) – Societe Brewing Co. This entry was posted in Insider Tips and tagged craft beer, SDBeer by Bruce Glassman. Bookmark the permalink.